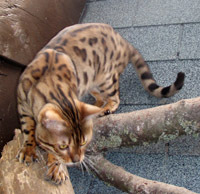 Located on eleven acres on a small island in beautiful Puget Sound in Washington State, Kamisha Cattery is dedicated to producing our vision of the perfect Bengal cat. We intentionally keep our breeding colony small and our cats are part of our family. All of our breedings are carefully planned, and done with a specific goal in mind. For that reason, we don't have many kittens each year. Kittens are all born in the house (usually in a quiet bathroom or the utility room) and handled daily. Once they are weaned, they move into the kitchen and living area where they can do their Bengal antics and cause untold trouble. They are well socialized and quite brave when they go to their new homes at 12 weeks of age. At that time, the kittens are up to date on their vaccinations and wormings. Pet kittens are already spayed/neutered when they leave us. All of our breeding cats are routinely screened for HCM (Hypertrophic Cardiomyopathy), a genetic heart condition that has been seen in some Bengal lines. Screening for HCM involves performing an echodardiogram on the cats. 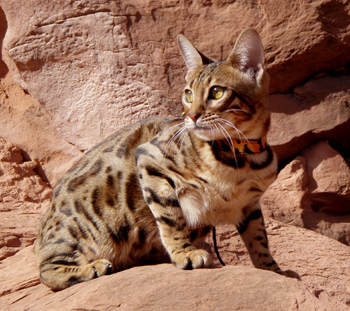 Our cats are tested at the Washington State University School of Veterinary Medicine by a certified feline cardiologist or by Dr. Woodfield at Northwest Cardiology. Our breeding cats reside in their own "jungle" adjascent to our house. The "jungle" consists of a heated sleeping barn and covered outdoor runs with logs and shelves for climbing and leaping about. Kamisha Arcane Art in his Jungle Domain.